In what is the first staging of Return To The Forbidden Planet since the death of its creator Bob Carlton, John Plews has put together a production that captures the show’s irreverent spirit. It was Carlton who on watching the 1950s B-Movie Forbidden Planet, first spied the potential to create a trinity of cultural fusion – blending cliched Hollywood not only with Shakespeare, but with rock and roll too. 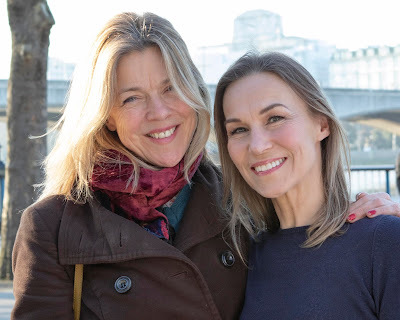 In a story that is (very, very) loosely connected to The Tempest, Carlton threw into the pot every hackneyed Shakespearean quote, and then some more, together with some of the strongest songs from 50 and 60 years ago, resulting in an evening of unpretentious fun delivered by a company of actor-musicians. With the Gatehouse configured in its compact traverse arrangement, simple scenic constructions suggest the spaceship Albatross upon which the action plays out. The plot is beyond credible description, though in all honesty no-one really cares as the corny links serve only as filler between each eagerly awaited number. Plews’ cast is, for the most part, youthful - and it shows. 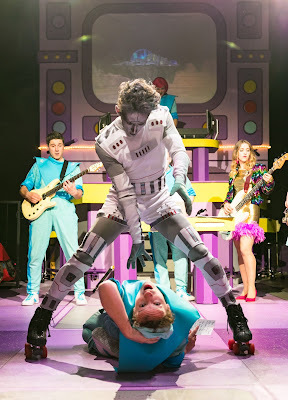 For Return To The Forbidden Planet to really work, every vocal soloist needs to step out of their musical theatre training and immerse themselves in the persona of a guitar-smashing rock star. These songs were written for rock gigs, not seated sedentary sexagenarians – so when health and safety (and quite possibly a few doctors’ orders too) keep the Highgate audience firmly seated, it becomes beholden upon the cast to make the songs soar. To be fair, there are some glimpses of excellence amongst Plews’ company: Edward Hole’s Cookie gives a blistering take on She’s Not There complete with awesome guitar riff; Ellie Ann Lowe’s entrance and vocals as Gloria (and wow, those boots too!) are a cracker, while third year Arts Ed student Simon Oskarsson offers up a robotic Ariel that has to be seen to be believed, such is this young man’s impressive talent. (Has Arts Ed lecturer Mark Shenton been teaching him the moves?) A nod too for David Persiva's powerful percussion delivered from a lofty drum kit, that drives the show's tempo. Its grins and tapping feet throughout, as Return To The Forbidden Planet’s return to the Gatehouse makes for a grand night out.